This post is about my experience with handphones, iOS, jailbreaking, Windows, and Ubuntu, that went on discontinuously from about Jumaat petang (Friday afternoon) until Subuh prayers the next day. i'm not a hacker nor cracker. i'm just an ordinary user who uses others' workarounds or solutions and try to improvise where/whenever i can... at least by explaining in detail the steps that work for me =). The jailbreak attempts deducted in total about RM30 of prepaid credit when my sim card was inside the iPhone for activating after restoring. When jailbreaking next time, either use a post-paid sim card with data plan or find another way to activate without a sim card. And my courier thinks i've just upgraded to a new smartphone :-\. See Pic 1. Pic 1 - Screenshot of the SMS from my courier. i "inherited" my husband's old iPhone 3G after he bought a Samsung Galaxy Nexus and at the same time gave away his old Nokia 5800 XpressMusic to someone who needed it more than me. If you're a little confused which handphone came after which: the old Motorola Razr 3 was replaced by the Nokia 5800 XpressMusic, which was replaced by the iPhone 3G, and later by the Samsung Galaxy Nexus. The Nokia was used as an MP3 player because of its external storage space, a massive 8 Gig compared to my phone's 1 Gig. Without the Nokia, the iPhone is forced to serve as the replacement. 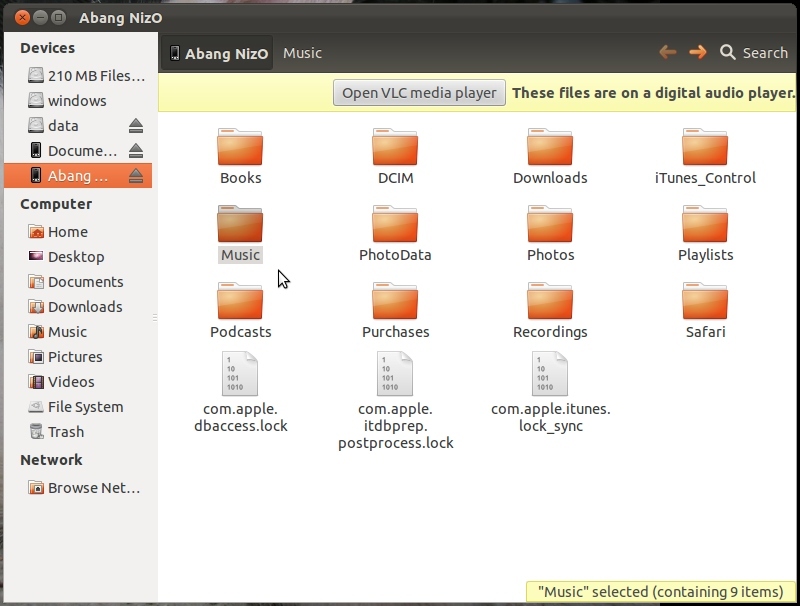 However, the problem with iPhone for Ubuntunians is transferring songs from the computer to the phone. Without using iTunes, the iPod app (not to be confused with the iPod devices) won't detect songs transferred to the phone using the simple Copy+Paste method; the same transfer method i used with the Nokia. i had to search for a way to transfer songs from my laptop to the phone while at the same time bypassing iTunes... because i'm running Ubuntu! Otherwise i'd have to purchase a brand new MP3 player and turn the iPhone into a pricey paperweight. The search pointed to PwnPlayer, an app almost as good as the iPod app. As mentioned in this previous post: How to solve Flash problems on Ubuntu 11.10 Oneiric Ocelot, the new laptop has dual boot; Ubuntu and Windows 7. Funny that i had forgotten totally about the dual boot. But i just don't feel like running back to using Windows just because i can't find an alternative in Ubuntu. The iPhone was previously jailbroken with a version of whited00r, which made the App Store unaccessible through the App Store button but accessible through Safari. -- Tedious for me. Something needed to be done about this. And the simplest i can think of is: update then jailbreak with something else. But i've never jailbreaked + i don't know how to! And my husband has forgotten how. The funny thing is: PwnPlayer was long dead! The website domain exists but without content. The app isn't listed in App Store nor is it in Cydia. -- Something i found out after many hours learning how and trying to jailbreak the iPhone just to install PwnPlayer. Update: 8th Apr 2012. The player is listed in Cydia (apparently i didn't wait long enough for the search results to load) but not in App Store. Sorry for the mistake. Update: 3 Zulkaedah 1433H / 19 Sep 2012M, Ra. I got it right the first time; PwnPlayer is not listed in the App Store nor Cydia. Thus to install the player, you'd have to get the app from elsewhere. See Chapter 4. So, how did i make repeated mistakes there? -- PwnPlayer will appear listed in Cydia after the player's installation. (i) Before install: PwnPlayer is not listed in the App Store nor Cydia. (iii) After install: PwnPlayer is not listed in the App Store but is listed in Cydia. Where did i learn about PwnPlayer in the first place? From a 2009 article, here: 6 Ways To Sync Music To Your iPhone Without iTunes. In order for jailbreaking, the laptop had to be rebooted to switch from Ubuntu to Windows. While waiting for iTunes to download, i read then followed some random jailbreak article at first. Thanks to the Dev Team for redsn0w. using the iFile method. Wasn't successful with the OpenSSH method. the player has no loop feature. Once you've reached the end of the last song, you'll have to manually restart the playlist. unable to continue playing in the background like on the Nokia. Thank you to Eric Castro for PwnPlayer. The player is great! One thing with PwnPlayer that made hopes sunk was: Why some songs played for a few seconds then the app closes suddenly but other songs played on? What are the differences between those two "types" of songs? A hunch brought to this solution which works for me but might or might not work for others. By now i've already rebooted again to switch from Windows to Ubuntu. 1. Any tag editor supposedly can do the job. i used Audio Tag Tool. i. Run Ubuntu Software Center. ii. In the search field, type-in "audio tag tool". iii. 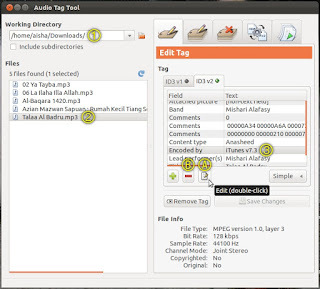 To read more about Audio Tag Tool, click the More Info button. To straightaway install, click the Install button. Notice that once Audio Tag Tool is installed, the Install button will turn into the Remove button. Pic 2 - Refer Step 1. 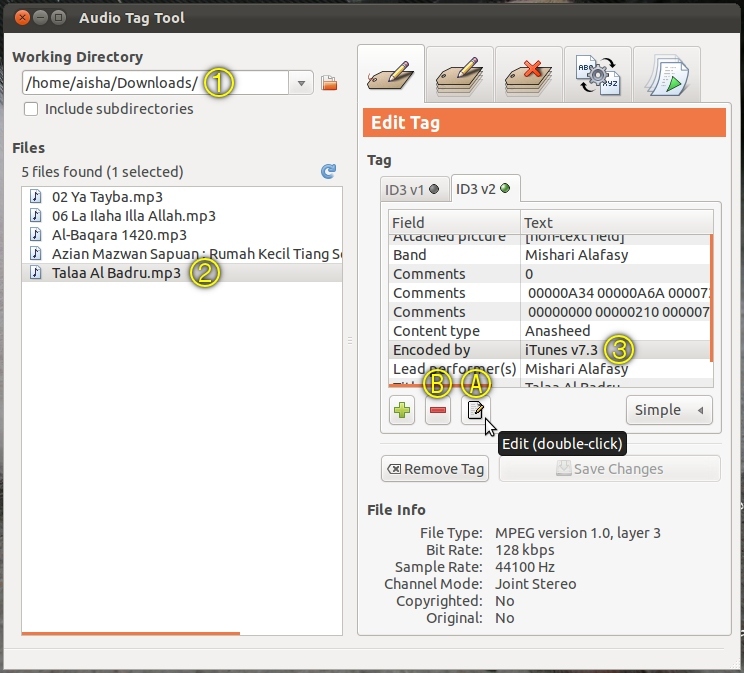 Searching for Audio Tag Tool in Ubuntu Software Center. 2. After installation is complete, run Audio Tag Tool. 3. In the Working Directory section, locate the folder containing the songs that need fixing. Mine is in the Downloads folder as seen in Pic 3. Pic 3 - Refer Step 3. Locating the song folder. The song i'm using is a nasyid by Mishary Rashid Alafasy titled طلع البدر علينا مشاري راشد العفاسي (Talaa al-badru alaina) which loosely translates as "The full moon has dawned upon us". To listen to another version of Talaa al-badru alaina along with Malay translation, go here: Selawat Badar oleh Zulkarnain Mat Nor. 5. In the Tag section, select the Encoded by field. i. To remove the field, click the Remove button (B in Pic 3). The Encoded by field will be removed. (b) edit the field's text. i. To edit the field, click the Edit button (A in Pic 3). ii. Referring to Pic 4, in the Edit ID3 Field window; in the Text field, delete the texts. Then click the OK button. The Encoded by field will remain but with no text. Pic 4 - Refer Step 5(b). Editing the text for the Encoded by field. 6. Click the Save Changes button. See Pic 5. This step is indifferent to whichever action you chose in Step 5. Pic 5 - Refer Step 6. Saving the changes. 7. Transfer the song from your computer to your song folder in the iPhone via simple Copy+Paste. Then run PwnPlayer. By now the song should play without causing the app to close. i use the default directory set by PwnPlayer. See Pic 6 (directory in PwnPlayer), Pic 7 (folder in iPhone), and Pic 8 (playing the song mentioned in Step 4). Pic 6 - Refer Step 7. 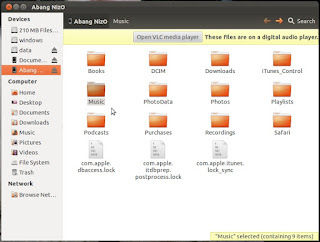 Screenshot of the song folder directory in PwnPlayer. Pic 7 - Refer Step 7. Screenshot showing the Music folder in iPhone. Contents of the folder are shown in Pic 9. Pic 8 - Refer Step 7. Playing the nasyid. Simply put, songs transferred to the iPhone without using iTunes will not be detected by the iPod app; the songs are there but not recognized. However, songs transferred as taught in Step 7 (Copy+Paste) will be detected and played by PwnPlayer as long as you point it to the corresponding folder. As can be seen in Pic 9, there are 9 song files in the Music folder in the iPhone. But none of the songs are recognized by the system as can be seen by the number of Songs in Pic 10. Pic 9 - Content of the Music folder in iPhone. The folder itself is shown in Pic 7. Pic 10 - No songs are picked-up by the system although the song files exist in the folder. This happened because the files were not transferred using iTunes. The iPhone 3G is now running jailbroken firmware 4.2.1 and is installed with PwnPlayer Lite v0.1b1 (see Pic 12). Screenshot in Pic 11 shows the PwnPlayer icon =). Pic 11 - Screenshot of the iPhone's current state. The Player icon launches PwnPlayer. Pic 12 - Screenshot of PwnPlayer version: PwnPlayer Lite v0.1b1.